Official ticket sales for all bullrings in Guadalajara. 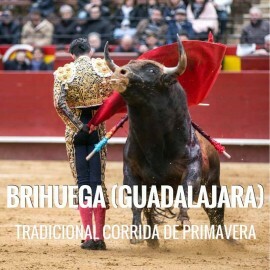 Brihuega. Fast and secure online ordering. Immediate information of all the Bullfighting Festivals. A virtual store with the most powerful technology and design of the sector. Easy navigation, transactions with high security and confidentiality of data. Bullring of Brihuega. Primavera bullfighting fair 2019. Fast and secure online ordering. Immediate information of all the Bullfighting Festivals. A virtual store with the most powerful technology and design of the sector. Easy navigation, transactions with high security and confidentiality of data. Brihuega is located 40 kilometres from Guadalajara Center. How to get to Brihuega. 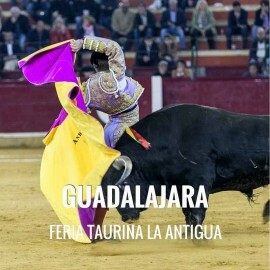 Feria Taurina de Primavera: on Saturday, April 27th. Servitoro, Official Box office of bullfighting tickets sales at Brihuega, Guadalajara bullring. Bullring of Guadalajara. 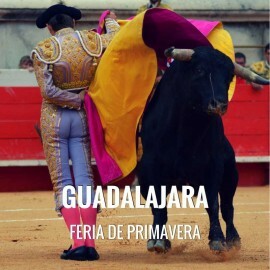 Primavera fair in April and La Antigua Guadalajara Fair 2019. Fast and secure online ordering. Immediate information of all the Bullfighting Festivals. A virtual store with the most powerful technology and design of the sector. Easy navigation, transactions with high security and confidentiality of data. How to get to Guadalajara. Primavera fair: April 6th and 7th. Feria Taurina from La Antigua: date to be confirmed. Servitoro, Official Box office of bullfighting tickets sales at Guadalajara bullring. 27/04 Brihuega (18:00) Toros mixta. PICK UP AT BULLRING.